1) 5 types of color pickers - movable and resizable. Recently I have posted screenshot of that pickers. 2) Stability improvements, many bugfixes. I have looked all bug reports that I have received and fixed almost all issues. Thank to all who have sent bug reports to me! 3) Focal shift slider. It is on top panel. Also you can assign that mouse wheel will change it (look Options). 4) Flipping sliders on top panel (Focal depth & smooth degree are also there now). Recently I have written about this in my blog. 8) Now you can make your own custom fill patterns in Fill tool. The screenshots are below. To create the new fill pattern you should specify texture of bump and texture of color (optional). They will be mapped on object using cube mapping with soft edges. 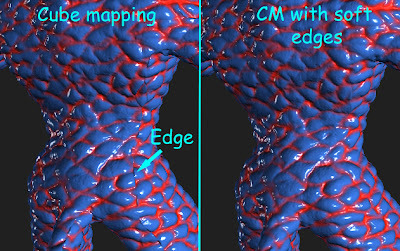 The screenshots below show the difference between usual cube mapping and mapping with soft edges. In so way you can texturize object seamlessly in very easy way. 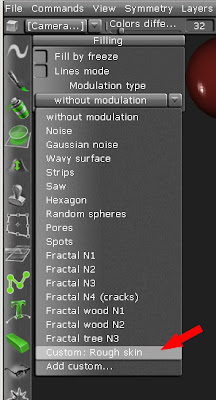 It is easy to create materials like skin or pores. I have add a sample material - something like dino-skin. 9) There in essential improvement for drawing with materials with cube mapping. The preview has become much more convinient, the cube mapping algoritm is improved so that object will be mapped seamlessly. I have written about it in previous section. 10) Clone tool and Sculpt tool now uses alpha even if it is not round. 11) Fill bugs fixed. There was conflict between Fill tool with depth channel and sculpt mode. 12) 3DB stores window position. When you will close 3DB it stores the window position. When you will run it again it will be restored at the old place. 13) The new option during import - preserve positions. I have written about it in one of previous posts. You can also assign focal shift change to mouse wheel in options. But when I have add the focal shift slider to the top panel I have understood that there is too many sliders. So I have made "flipping sliders" - now you can minimize/restore every slider on the top panel like it is shown on the screenshot below. The slider will be replaced with the button with the first letter of slider's name. 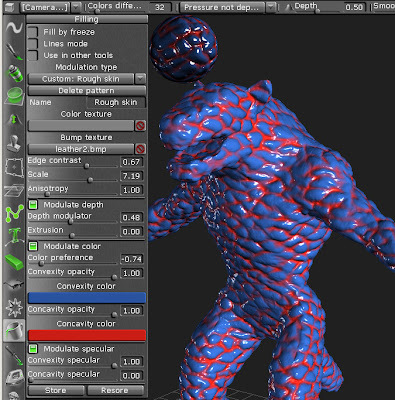 Also I have fixed bug when during filling using depth channel there was bugs in Sculpt mode. Also, Color pickers are now resizable and dockable. I have almost done more convinient preview of texture moving using cubic mapping. It was very inconvinient to move/scale texture in cubic mode because when you press RMB the preview of pen disappears. Now there is floating patch over the surface. Another important improvement - cursor shape depends on place where cursor is. Cursor changes it's shape over sliders, navigation controls, flipping sliders, movable windows headers, over surface and so on. The other feateure - import meshes with original positions preserving. Like you know, Catmull-Clark algoritm changes positions of vertices because of smoothing. I have add an option "Preserve positions". In this case in every stage of subdivision points will be moved to them original places using some additional interpolation for new points. This is not 100% solution because sometimes it breaks ideal smoothing, but sometimes it works really good. Today I plan to make many bugfixes and implement "Focal Shift" for pen. I am Andrew Shpagin, the developer of 3D-Brush. 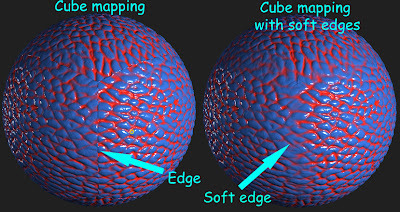 This is my personal blog devoted to the development of 3D-Brush. This blog is created to give fast and non-official information about 3D-Brush. I will post there daily news, what I am doing now, what features are under development this moment. It could be really interesting for everyone who is interested in 3D-Brush.